Author’s Note: This is the third installment in an ongoing series meant to introduce the Postural Restoration Institute and the concepts that it teaches, as well as how to integrate them into training and rehab. If you missed either of the first two installments, you can click here for Part 1 and here for Part 2 to give those a read. 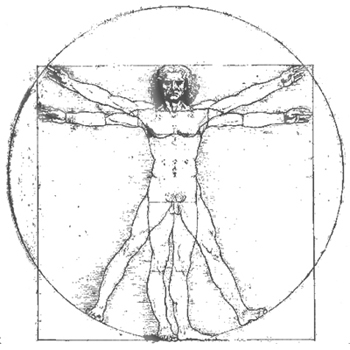 In this installment, I’ll move from the neurological and biochemical/molecular underpinnings of PRI’s methodology discussed in Part 1 and Part 2, respectively, to the more palpable anatomical component, including the common postural and movement patterns that the PRI model describes. The integration of these concepts into training and rehab programs will be covered in greater detail in Part 4. The net effect is a bias towards the right side, which usually presents as a tendency to shift our weight onto our right leg when standing and our right ischial tuberosity (“sit-bone”) when sitting. This is the proverbial starting point for a sort of “chain reaction” that will result in compensations at the different joints in terms of posture and movement. Before I describe those compensations, however, I first need to explain PRI’s concept of polyarticular chains. 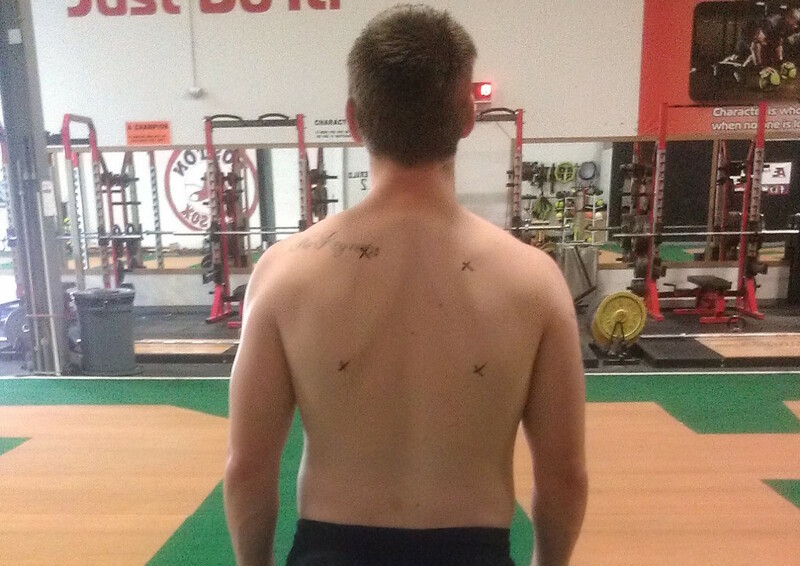 A good visual of the shoulder and scapular positioning in a Right BC pattern–the borders of the scapulae have been marked with X’s for emphasis. —Injury Reduction: I’d first like to note that I deliberately chose the term “injury reduction” over the often used “injury prevention”. Realistically speaking, there’s no way to “prevent” injuries—unfortunately, things that are outside of our control can and do happen no matter how much or how well you prepare, train, etc. As clinicians and coaches, the goal should be to put the client in a figurative and sometimes literal position that makes them less vulnerable to those events and thus minimizes their risk of injury. —Neuropsychological/Stress Management Aid: In these first three installments, I’ve established that chronic activation of the stress response of the ANS drives physiological responses (primarily via the cardiorespiratory systems) that can lead to specific patterns of muscle activity, posture, and movement. While the most obvious and probably most effective way of resolving this situation and mitigating this response would be to remove the stress altogether, in today’s world this is not plausible more times than not. We are thus forced to look for alternatives, and PRI provides one: becoming better at coping with and responding to stresses and threats. Stephen Porges’ Polyvagal Theory states that an inability to successfully remove or mitigate a stress or threat results in “falling back” on a more primitive response; for example, chronic stress can cause us to abandon prosocial and self-soothing responses and fall back on the sympathetic-driven fight-or-flight response. If we focus on reinforcing those prosocial responses, however, and “teach” our body to get out of a sympathetic-dominant state, then we can essentially make ourselves into better copers in the sense that we are able to respond to chronic stress that is less taxing on our bodies and more conducive to good overall long-term health. PRI does exactly that: it attempts to counter the physiological manifestations of the stress response (increased cardiorespiratory activity, specific patterns of musculoskeletal activity) via focusing on breathing and muscle facilitation/inhibition in order to move us out of a sympathetic-driven response to stress and to promote a response that is more neutral in terms of the balance of ANS activity. —Performance Enhancement: In order to optimize performance in the gym or on the field of play, an athlete must be able to maintain both neurological and musculoskeletal variability, being able to shift into and out of both neurological states as well as different movement patterns and postural positions as quickly and efficiently as possible. From a neurological standpoint, an athlete going 100% during a game needs to be able to “switch over” to a more parasympathetic-dominant recovery mode as soon as they take a rest, so that they are optimally prepared to perform when they return to play. From a musculoskeletal standpoint, if an athlete is “stuck” in a pattern that includes chronic hip flexion, then their ability to achieve full hip extension may be compromised; this could result in a decreased ability to produce power in movements as basic as running, and/or lead the athlete to compensate by getting that range of motion and power from another joint (perhaps the lumbar spine in the case of the hips) that isn’t necessarily equipped to handle that added stress. As I’ve already outlined under the previous two applications, PRI addresses and can help to improve both of these abilities. This article series has been the greatest explanation of the PRI system I have ever read. You got to make part 4! Hurry up! Yes would love to see a Part 4!